We strive to keep updated on the latest equipment and techniques to better serve our patients. Our massage will be catered to your specific needs based on your diagnosis. 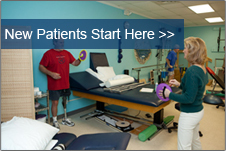 Our mission at The Therapy Center of Cedar Point is to meet the physical therapy needs of the citizens of Carteret-Onslow counties and surrounding areas. We strive to provide a friendly, clean and courteous atmosphere, while ensuring state of the art physical therapy services in a professional, efficient and caring manner. Our experienced therapists provide quality comprehensive physical therapy services by designing individualized programs that educate clients, improve function and enhance overall physical health and fitness. The Therapy Center also offers aquatic therapy and massage therapy services to complement our physical therapy services. The Therapy Center is a therapist owned clinic and accepts referral from all physicians. North Carolina is a direct access state for physical therapy evaluations; therefore, we can see patients without a physician referral. We promote the patient’s right to choose a physical therapy provider that they feel most comfortable with to ensure they have full confidence in the care they receive. of where you go to Physical therapy is YOURS! How do I dress ? You should wear loose fitting clothing so you can expose the area that we will be evaluating and treating. For example, if you have a knee problem, it is best to wear shorts. For a shoulder problem, a tank top is a good choice, and for low back problems, wear a loose fitting shirt and pants, again so we can perform a thorough examination. Who pays for the treatment? In most cases, health insurance will cover your treatment. Click on our insurance link above for a summary of insurances we accept and make sure you talk to our receptionist so we can help you clarify your insurance coverage. How long will each treatment last? Our goal is to spend 45 minutes to an hour one on one with each patient.